Every morning starts out with a HUGE cup of tea. I can’t do without it and I like to make it really milky and slightly sweet. My two fav teas are English Breakfast and Bombay Chai – this was the English Breakfast tea before I added milk. 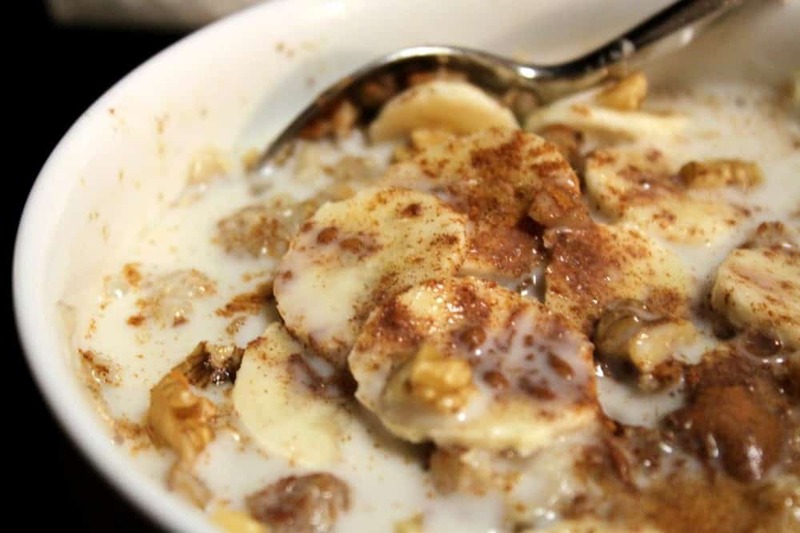 I also love my oatmeal, so I’ll usually have a huge bowl of steel cut or rolled oats oatmeal with a variety of toppings: flax seeds, chia seeds, nut butter, milk (soy, almond or regular depending on my mood), stevia, honey, sliced bananas, walnuts, the list goes on and on. Yesterday it was my Banana Bread Oatmeal which was creamy, sweet and delicious. 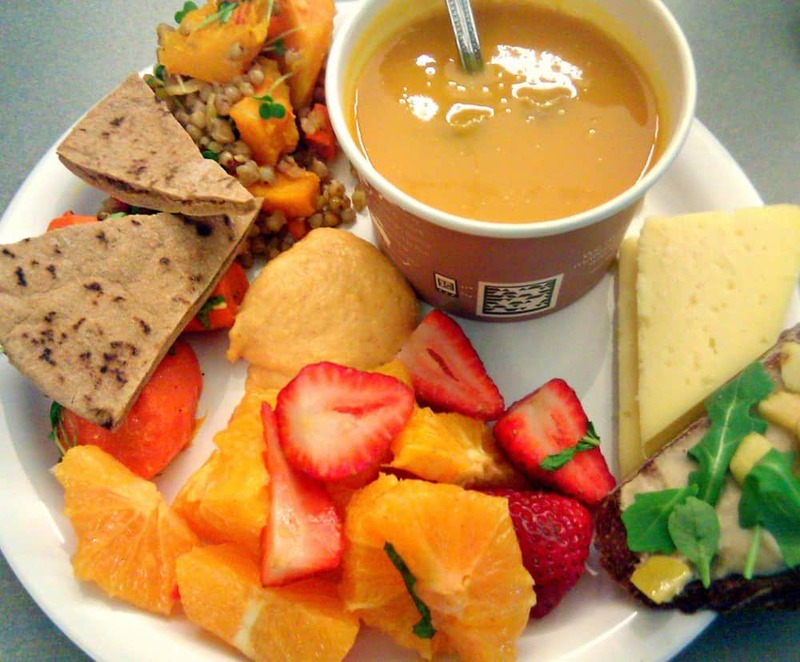 Fresh fruit, a couple cheese slices, spicy carrot hummus and whole wheat pita chips, roasted carrots (which were underneath the pita chips), roasted squash with israeli couscous, butternut squash soup with walnuts, and a crostini with white bean puree, arugula and apples. I like having a bigger meal for lunch sometimes with a variety of ingredients, and then having a lighter meal for dinner. That’s what happened yesterday. I like these bars because they’re basically all natural, low in sugar, 200 calories, gluten free and have 10g protein and 4g fiber. For dinner, I got home late and was exhausted (not unusual for a work night!) so I decided to make a grilled Almond Butter, Peanut & Flax Seed Butter and Honey Sandwich on Sprouted Grain bread. You can add banana too, but I chose not to since I had it for breakfast. After dinner, I always have dessert! 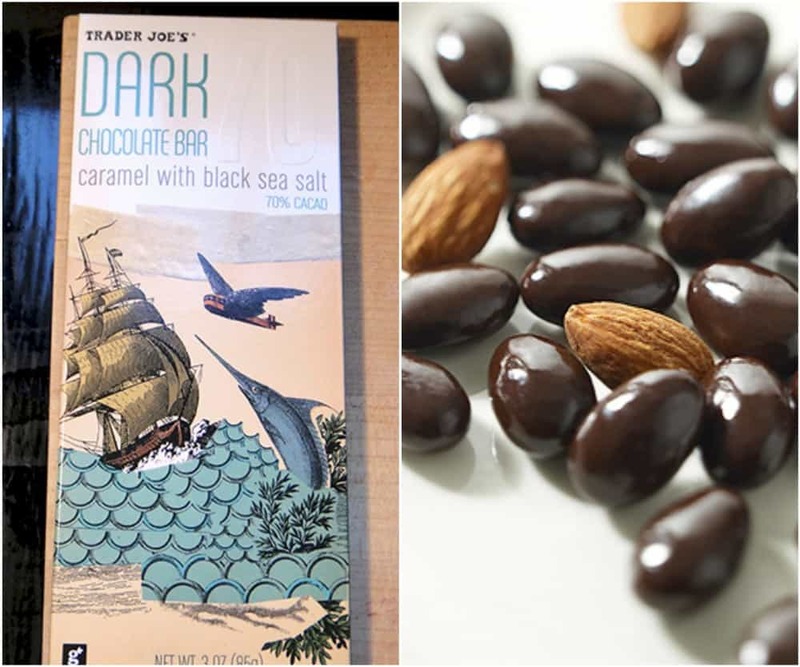 I had a few (4-5) dark chocolate covered almonds, and 1 piece of this Dark Chocolate Salted Caramel Bar from Trader Joe’s – this might be my favorite chocolate of all time. And that was it! Generally I try to eat about 1600 calories a day, some days a little more, some days a little less. I don’t stress out too much about the calories but I do try to make sure I eat a bunch of fruits, veggies and whole grains. Oh and the most important part, I always, always eat dessert. It’s my treat at the end of the day. I just your blog today and I must say it is definitely amazing 🙂 I just want to ask what type of bread brand do you buy? I check a lot of famous bread brands such as Arnolds, Wonder, etc and they have either sugar or just a lot of preseratives. I found out about Eskiels 4:9 and I like the ingredients, I must say it probably the healthiest out of any other bread brand but I just have problem with two of the ingredients listed there; yeast and wheat gluten. I dont have gluten intolerance but I want to eat a bread that is gluten free and I heard yeast isnt good. Can you explain to me about yeast and gluten? Thanks 🙂 & I would like to know what sprouted whole grain bread you buy. Hi Shirley!! Thank you so much for your comment – I’m so glad you’re enjoying my blog and it’s so wonderful to “meet” you! 🙂 So I usually buy Ezekiel’s sprouted whole grain bread, but if that’s not available I buy Trader Joe’s sprouted whole grain bred or Alvarado Street Bakery’s sprouted bread. All are great options. Regarding yeast and gluten — I would only recommend avoiding them if you have digestive issues (e.g. bloating, indigestion, frequent stomach aches, gas, etc). If you don’t have any digestive issues at all, then yeast and gluten in moderation are fine. Yeast can be hard for some people to digest because of a bacteria called candida, and gluten can be difficult to digest for people with either celiac disease or a gluten intolerance/allergy. 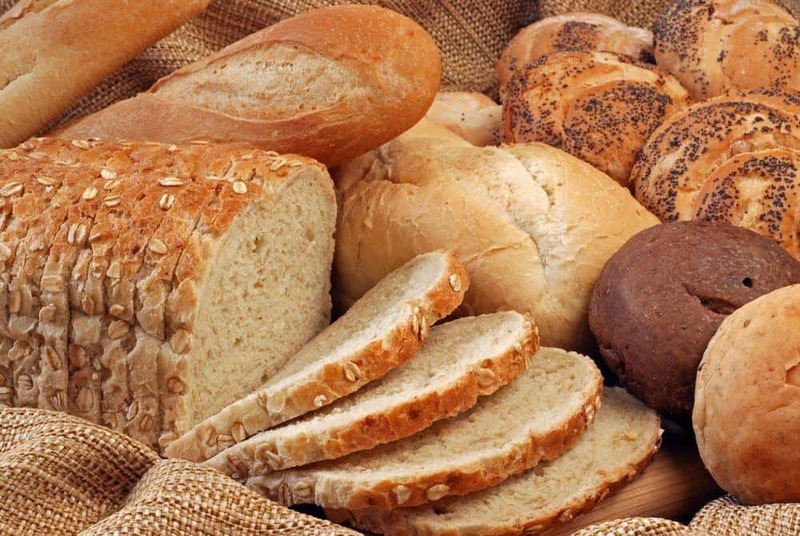 If you decide to go gluten-free, you have to be careful when choosing a gluten free bread because many of them are highly processed — since it takes a lot more “work” and ingredients to make a bread that’s gluten free but still tastes like “bread”. But in general, I wouldn’t recommend avoiding gluten and yeast completely if you have no digestive issues or allergies. Hope that helps! Let me know if you have any other questions! I just stumbled onto your blog and find it very inspiring, especially since my husband and I have very differing palates. Your blog gives me hope that maybe one day both me and my husband can enjoy eating healthy, too. One thing that I couldn’t find on your blog was how you make your tea. My husband is a big time tea drinker. It is his beverage of choice over all others. I, on the other hand, do like tea but my first love is Dr. Pepper, so even when I eat healthy, my biggest weakness is my beverage choice. I have learned to drink more water and I don’t dislike the taste like I used to but I still have a long way to go. Water just gets very boring to me after awhile even though I know it is so good for me. We usually make a gallon of tea at a time so making tea one glass at a time is new to me. If you have this information on your blog already, can you point me to it please? I know almost nothing about brewing with loose tea leaves and using an infuser. I’ve never tried English breakfast tea and definitely never considered putting milk in my tea. I’m a Southern girl from Virginia and have only known sweet and unsweet tea and a little of green tea. If you don’t have a post dealing with tea or other healthy beverage choices, would you consider one day using this as your blog topic? Thank you for having this blog! Hi Vickie!! Thank you so much for sharing your story with me – it’s wonderful to meet you! I really hope you and your husband are able to enjoy the recipes on my blog 🙂 So to your question about how I make my tea – it’s really very easy to make a cup of hot tea in the morning (or anytime of the day!). 1) Boil hot water in a tea kettle. 2) While the water is boiling, grab your mug and tea of choice. 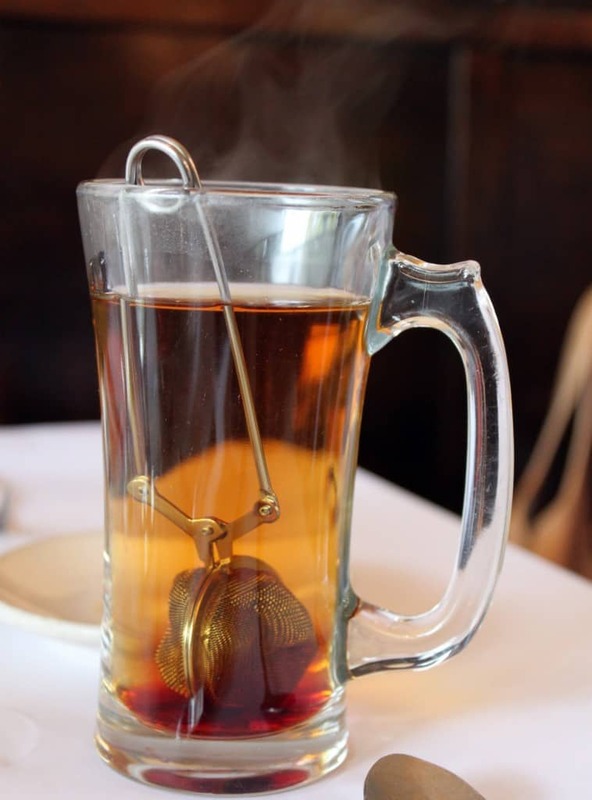 If you’re using loose leaf tea, put a small amount in a tea ball or tea strainer, and put it in your mug. Note: Both loose leaf and packaged teas will tell you how long you need to steep it for and how much of it to put in your cup (e.g. 1 Tbsp of loose leaf tea) – so just follow those directions. Also – most teas will tell you whether to use milk with them or not. The general rule is – black tea, use milk. Herbal/green teas, don’t use milk. 4) Let your tea steep, then put in milk and a dash of sugar (I drink my tea without sugar). And that’s it! It should be ready in about 5-10 minutes from the time you start boiling the water. I can definitely do a post on healthy beverage choices in the future but here is a cheat sheet for you: water is great. If you’re tired of water, try coconut water — but only the brand Purity Organic makes true coconut water, all the rest is basically just sugar. And if you like juices, try using 1/4 cup juice mixed with 3/4 cup sparkling water (you can even get naturally flavored sparkling water with no sugar/fake sugar in it) – it tastes great in the summer time! Tea is also great, as is 1% organic milk. Hope that helps! Let me know if you have any questions! I must say that it was a complete miracle to stumble upon your site in my desperate need to change my unhealthy eating habits. Growing up I always wanted to eat healthy but my mom was the chef in the kitchen cooking for a house of nine so it was never affordable to eat as healthy as I preferred and one knows to never challenge mom! However, I am a freshman in college now and I can feel the horrible health effects of eating cupcakes and donuts to help keep me energized throughout the day. Today after sleeping all day from feeling drained even though I got plenty of sleep I finally decided enough was enough and began to google tips for eating healthy while on a budget. I finally came across your blog and I have not been able to get off or complete any of my assignments and it is now going on 2am but it is totally worth the loss!!!!! I look forward to incorporating all of your methods and meals within my transition and I always dreaded the adult life but now I can’t wait until I am an a full blown adult with a family so I can promote a healthy lifespan for them, but for now I will use my friends as guinea pigs!! I absolutely love this website and I now have a role model as I never knew that there was an individual out there whom was actually living out my fantasy health life. I could go on and on, even write a whole book but I don’t want to overwhelm you. Thank you for creating this site as it will truly help me turn my life around without tasteless complications. Moreover, I was also excited to hear that you did not know how to cook at first so that motivates me even more. Okay okay I won’t carry on even though there is so much to be said. Omg I heart you, I would use the L word but I don’t want you to think I’m crazy. By the way, have you ever thought about opening up your own restaurant or a mini cafe of some sort? 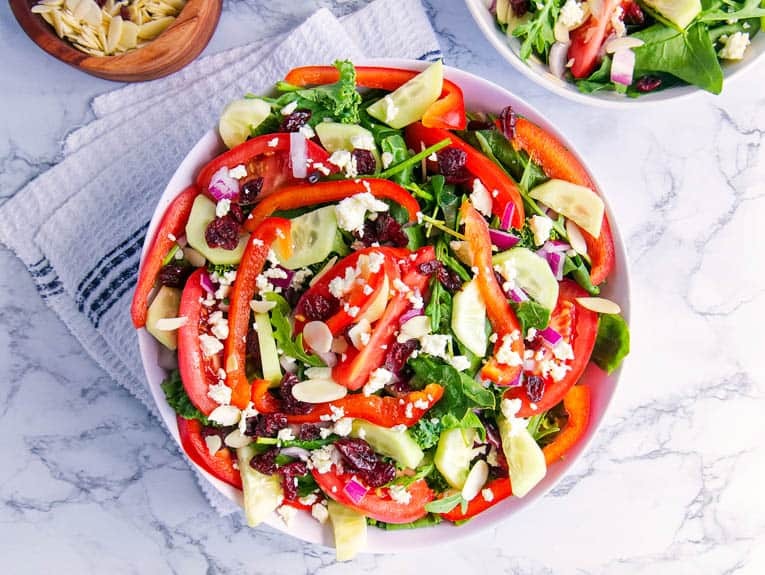 I have an inkling that it would be a huge success, as there are many women and especially mothers who would love to go out and eat healthy but it seems so impossible. Okay I apologize once again for this essay, but there was just so much to say. Oh one more thing the free 7 day meal plan and the detailed recipes are awesome. Furthermore, I cannot believe you took the time out of your day to reply to every comment, that is truly just…..well I am now just speechless and I should go to bed now before I write a novel :)!!!!! Hi!! Thank you SO much for your wonderful words and amazing comment! Your post totally made my day 🙂 I’m so glad my blog has inspired and helped you to eat healthier, cook more, and continue on your journey to living a healthier life. And yes!! I literally had NO idea how to cook when I got married. I couldn’t even use a can opener! So if I can do it, anyone can 🙂 I promise my recipes are easy and simple, and a lot of them can be made in less than 20 minutes. I can’t wait to hear how my recipes turn out for you and which ones you end up trying! As for a restaurant or cafe — I haven’t thought about doing that yet, but you never know! Keep me posted on how things go — and let me know if you have any questions or if I can help in any way. Thanks again and I hope you have a great week!! Where did you get the think thin crunch bar? I got mine at Trader Joe’s – but you can get it at pretty much any grocery store these days, and you can also find them on Amazon. Hope that helps! This is a pretty random question but how do you make a great cup of chai tea?!! Oh and what brand of tea do you use, if you don’t mind? I have tried and it never turns out good. A milky chai tea sounds delicious and I want to make one very badly!!! Hi Jesse! Ah yes – chai tea making can be quite the event – everyone has their own preferences and methods. For me, I like using any black tea leaves (Tazo’s Awake is a good black tea, as is Mighty Leaf’s tea). You can also use Darjeeling Tea for a different flavor. Then I like to combine: cardamom pods, ginger, cloves, cinnamon and a couple peppercorns with the tea and boiling water — boil for 5 minutes, let steep for 10, strain and combine with milk and honey. Enjoy! Do you exercise a lot? I tend to gain weight super fast if I start eating carbs. Any suggestions? Hi Angela! I do exercise, I wouldn’t say “a lot” – but I make it a point to exercise about 5-6 times a week. Usually I’ll run / walk about 2-3 miles (it takes about 30 minutes max). If I’m not in the mood for running, I’ll do yoga/pilates for about 45 minutes. As for your question about carbs – honestly it really depends on which carbs you’re eating and how much of them. If you’re eating a lot of white/processed carbs, I’d recommend trying to replace them with whole grains or complex carbs. Complex carbs take longer to digest so you feel fuller longer, and you tend to eat less of them when you do! Hope that helps – if you have other questions feel free to email me at pickyeats@gmail.com and I’d be more than happy to answer them! Wow, you did a really nice job of selling your daily meals. The pictures say it all. Your meals look just like my wife’s diet except she drinks coffee instead of tea and eats for pure health and her meals don’t quite look as appetizing as yours. Haha thanks Charles!! I’m so glad my meals look appetizing 🙂 Sounds like your wife and I have a lot in common!! I just discovered your blog and I love all of your great ideas! I am a fellow health nut so I consider your site a treasure to find. I am actually trying to put on some weight in a healthy way. Any suggestions? Aw thank you so much!! I’m so glad you like my blog and my recipes! So yes – I have plenty of suggestions for putting on weight in a healthy way (I recently went through the same thing and was successful in putting on a bit of weight!) Some of my favorites when I was trying to gain weight: Almond Butter and Sunflower Seed Butter are great – but basically any nut butter is perfect – healthy fats + protein + calories, and delicious too! Avocados are awesome – I put them on every sandwich – healthy fats + calories. I drank 1% or 2% organic milk a couple times a day which helped, greek yogurt is great, cheese in moderation, and organic eggs – I liked making a 3 egg white scramble with 1 egg yolk and a bit of milk – delicious. Nuts and seeds are great and I incorporated them a lot into smoothies: I’d literally add walnuts, chia seeds and flax seeds to everything: oatmeal, smoothies, cereal, even sandwiches and stir frys! Flax seed oil is also really good for you – I’d add that to salads & smoothies. Hope this helps! Let me know if you want more ideas or if you have any questions 🙂 Good luck! Thank you so much! Haha you are right – the chocolate covered almonds look like you can just take a bite right out of the picture! So glad you enjoyed the look at my food day, and hope you enjoy my recipes! Thanks so much for this beautifully yummy post. I’m going to share with my clients who believe that 1600-1800 calories means deprivation! Love the recap! Your lunch looks like so much fun – tons of things to taste! 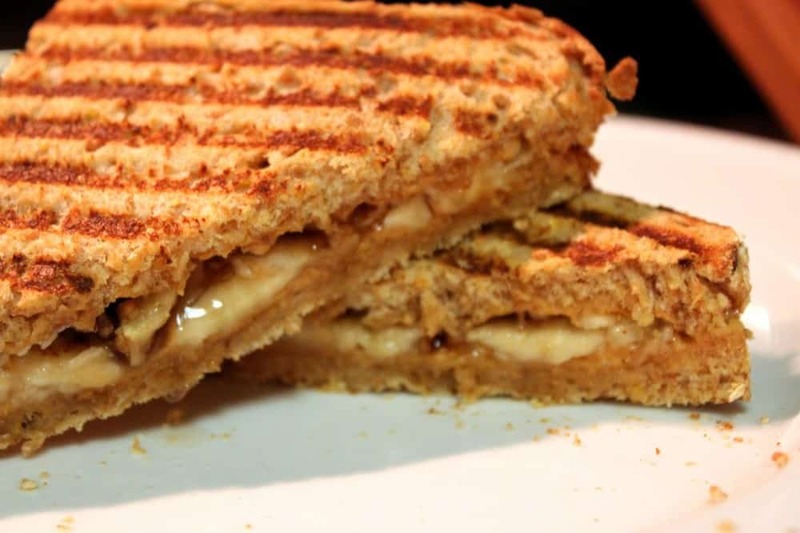 Also, grilled PB is one of my faves. Leftovers are usually my favorite quick dinner and if we don’t have any, I go for a romaine, raw tofu, avocado and Spicy Peanut dressing salad! Oh yeah I love leftovers – we eat those a lot. Thanks for that salad suggestion – that sounds delicious!! It helps to know I’m not the only one who has to have a little dessert at the end of the day. I’ve been really trying to lose weight (just started the last couple of weeks) and have enough calories to do that, so I plan on it. Of course, I try to keep it small like this, and with dark chocolate, it’s so rich, a little works well. I totally agree! 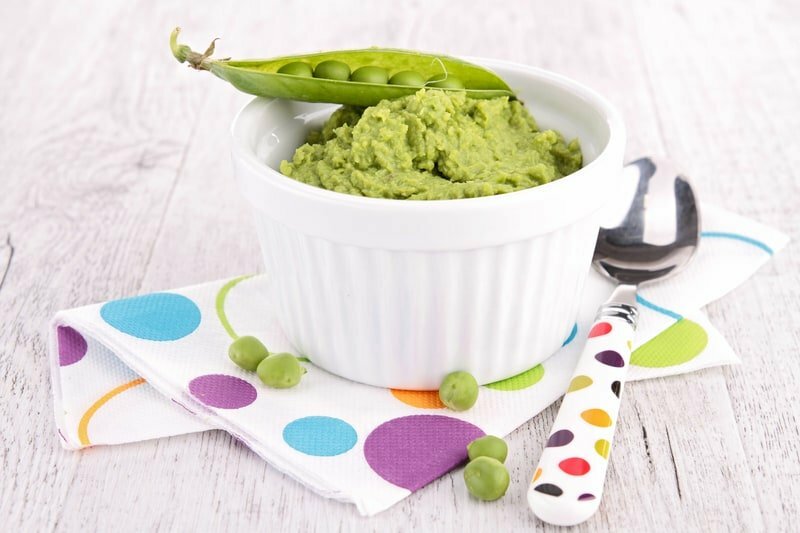 It’s important not to deprive yourself completely – even if you are trying to lose weight. Moderation is key 🙂 Good luck on your weight loss journey – let me know how it goes! !